Looking for the best lawn fertilization service in the Apex, Cary, Carrboro, Chapel Hill, Durham, Hillsborough, Morrisville and the West Raleigh area that is safe for you, your children and pets? Pleasant Green Grass provides organic lawn fertilization services that gets better longer lasting results when compared to the competition. We treat both cool season and warm season turf. 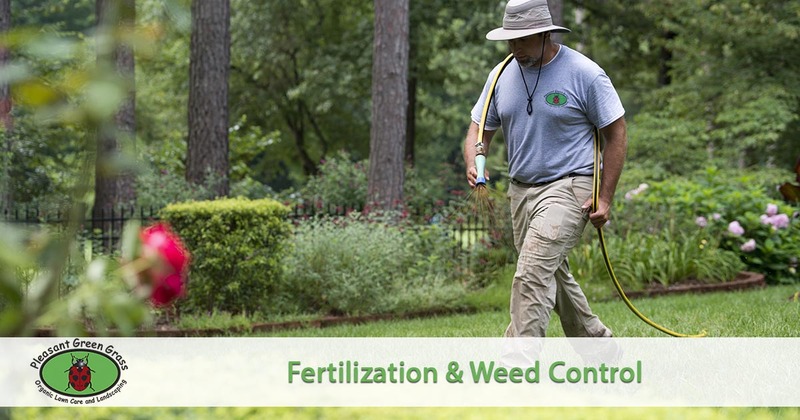 We offer a variety of year round organic fertilization & weed control programs. Our organic lawn treatments are based on what each individual lawn needs. Every lawn is different, from the soil and sun exposure to grass type and fertilization history. Every lawn is unique and requires a specialized program. At Pleasant Green Grass, we design a program that fits your lawn and your expectations. We can suggest an aggressive approach to get your lawn in great shape as quickly as possible or we can suggest a slow and steady approach to improve your overall soil health. Our approach to lawn care is primarily Soil Health. We take an environmentally friendly and holistic approach, using only organic materials, to treat poor soil and bring it back to health. Our approach is a long term investment in the health of your soil, the health of your family and pets, our employees and the local environment and wildlife. We want to note these differences when attempting to compare our services apples to apples. There can be many hidden costs when using conventional chemical lawn care services. It took years for your soil to fall into poor health which is why we approach solutions by treating the root causes first and foremost. It typically takes a season or two to figure out the specific problems affecting your soil health so we generally start with a program and then make alterations to fit the specific needs of your lawn. Weeds are a symptom of poor soil health and our ultimate goal is to create a healthy turf that will naturally resist weeds. Using an organic program will require some time and patience, but once your soil is healthy there will be minimal treatments needed in order to maintain the soil health and a beautiful lawn. We typically offer a year round program consisting of 5-6 treatments. Those treatments typically include Organic Compost Tea Fertilizers, Organic Weed Control (pre and post emergent), Overseeding and Aeration. Each time you use one of our products or services you are taking a step towards a more healthy beautiful lawn and creating a safer place for our community, families and environment. At Pleasant Green Grass, we pride ourselves on being your source for complete lawn care & landscaping. Whether its weed control, sod, or organic fertilizers or something more complex like patio design Pleasant Green Grass is the company you can trust! Price varies based on square footage. Call or Email for your free estimate today! Organic Fertilization & Weed Control are two of the most important things for a beautiful healthy lawn! A well-fed lawn recovers more quickly from stress and is more aggressive against weeds. As with all living things, proper nutrition is important to prevent diseases and insects. At Pleasant Green Grass, we use 100% Organic Fertilizers in our organic lawn treatments. Some soils are exceptionally good at growing grass and others are tough but most are in between. The results of organic lawn care are always going to vary depending on the soil conditions. What Organic Fertilizers do we use? GlutenGreen is an organic fertilizer derived from Corn Gluten Meal, Bone Meal, and Sulphate of Potash. Corn gluten meal, which is edible, is an EPA approved organic weed control. It’s presence in the soil stops seed from germinating properly. GlutenGreen produces a long lasting green up of turf grass with its 100% organic source of slow release nitrogen. The combined action of the fertilizer plus weed control will help stop new weeds from germinating while thicken up the turf. It’s the organic equivalent of a weed and feed. GlutenGreen results improve each year. The first year we can see up to a 60% success rate and up to 90% success rate if used over a three-year time period. GlutenGreen works best if applied in February, prior to the weed germination period. For improved results it can also be applied in the fall to help suppress fall germinating weeds. Compost tea is a liquid spray teeming with live beneficial microorganisms, micronutrients and soil conditioners. It’s actually more like a soil conditioner instead of your typical N-P-K fertilizer. The compost tea helps produce strong plants that are more resistant to insect and disease problems and more resistant to extremes in temperature and moisture. Every chemical-based fertilizer, pesticide, insecticide and herbicide harms or outright kills some part of the beneficial life that exists in soil. Compost tea has the opposite effect and will improve the life in the soil and on plant surfaces! Using compost tea will increase the beneficial soil microorganisms and reduce disease-causing pest organisms. Humate Soil Conditioner with Seaweed Extract is organic matter that has a positive effect on the physical, chemical, and biological reactions of the soil leading to an increase in soil fertility. Humate is comprised of Humic Acid and Fulvic Acid (composted over millions of years) which are proven to promote root strength and develop beneficial microbial activity. It also helps increase the soil’s capacity to retain water by making the soil more permeable. Our Organic 5-4-3 Fertilizer is made from 100% all natural poultry layer manure. This is an all-purpose lawn and landscape fertilizer. It’s slow release for steady long-lasting color and growth. Analysis: 1.0% water soluble nitrogen, 4.0% water insoluble nitrogen, 4.0% P2O3, 3.0% K20, 9.0% Calcium, .08% magnesium, 0.2% Iron. It’s OMRI listed. One Earth weed control is an organic product that is available exclusive to Pleasant Green Grass! We have rigorously tested and formulated this weed control to work in our North Carolina compacted clay soil. It is a more advanced compost tea application with added post emergent weed control that is not available anywhere else. It’s all natural and made from food grade ingredients. It works exceptionally well on broad leaf weeds and also helps to green up warm season grasses. Some weeds like henbit, purple deadnettle, fennel, shiny cudweed and Johnny jump up will die within a few days. Other, harder to control weeds such as wild strawberry, plantain, clover and dandelion may take a few applications. Clover is not always controlled immediately but will eventually fade out as the nutrients in the soil build up from repeated applications. Getting the very best organic lawn fertilization doesn't cost any more than traditional services that are hazardous to the health of your family and pets. Call Pleasant Green Grass today at 919-357-8245 and get started with a healthy approach to lawn care.